We are winding downhill past San Ramon in search of a few cooperatives of artisans that Jairo and I had researched about via the internet. 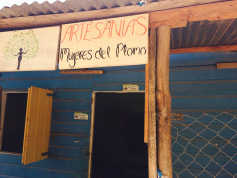 I happen to glance up and catch the sight of a homemade sign, “Artesanias: Mujeres del Plomo”. “I think that was the turn”, I say to Jairo. He pulls the car over into a dirt patch and scans in both directions before making a three point turn in the middle of the road. We drive back towards the sign, slower this time and indeed it is the turn off. Jairo navigates the small car easily up the brick paved road. This little barrio consists of 30 wooden homes all about the same size and construction. At the fifth house on the right hand-side, we spy another sign that matches the one back at the head of the road. Three young boys come running down the narrow road to stare at us as we exit the car. I scan the area for dogs and cautiously open my car door. The door to the workshop is open and I push Jairo in front of me in case there is a dog lurking about inside. I can hear the sound of a small Dremel drill and see the operator tightly holding a rainforest seed and drilling a hole. Two women look up and smile, welcoming us to the workshop. 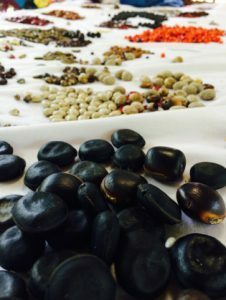 The 8 foot table in front of them is decorated with small piles of rainforest seeds. I feel like I am back in Monteverde, Costa Rica at the workshop of our artisan partners who also create seed jewelry. Jairo shares with the women that we had learned about their group from the internet and traveled all the way from Masaya to hear about their project and see their wares. They seemed very pleased and began to give us a tour of their products. 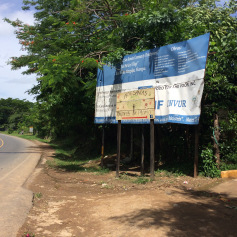 This is the story of how the barrio of Mujeres del Plomo began: After Hurricane Mitch destroyed their homes, Maricella who was a resident of an affected barrio, petitioned the local government for assistance with relocating the families. She explains how she diligently gathered information about how many families were in need of new housing, how many members there were in each household, their ages and gender. She compiled all of that data and presented it to the organization that was in charge of the relocation efforts. She explained how the government granted each of the families a 15×15 parcel of land and the materials to build a wooden house for $200. Each family could have 10 years to pay off their parcel and house at no interest. For us in the States, this might not seem like much money for a monthly payment, but as I have witnessed on Isla Solentiname, there are communities where there is no employment available. To scrape together even $2/month can be a challenge. The majority of the families did it though. Ten years have passed and all but three families, whose parcels are now empty since they didn’t pay their loan and the government came and repossessed their houses, are home-owners. Spain entered in the picture after the parcels were divided and donated cement for each house to have a cement pad. Maricella proudly tells how the majority of the families are single moms and they, along with their children, built these houses with their own hands. I ask Maricella how old she is. “40”, she tells me. You can tell by quickly looking at her that she is what is called “Chispa”. She has that spark of a leader. 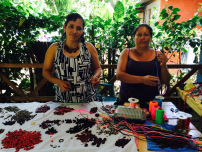 While browsing, I began to tell here about our project in Costa Rica and how my husband and I back in 2000 helped a group of women to form a similar project. Jairo went on to explain about our organization’s work in Nicaragua over the past six years and how we partner with small artisan groups to help them build capacity and find markets for their products. They listened with great interest as Jairo went on to explain about our a small grant program as well as our no-interest micro loan program for our artisan partners. “No-interest?”, Maricella asked. “Yes”, Jairo explained. “This is a way we can help our artisans to be able to purchase new equipment or upgrade their current equipment.” “Wow.” Maricella exclaimed. “We needed two new Dremel drills last year and had to take out them out on credit.” “How much is the interest?” I asked. “22%”, she said. I thought that maybe I heard incorrectly so I asked Jairo in English. “22%?” That sounded like credit card rates to me but Jairo confirmed that it was true. While looking through the jewelry, I find many pieces that I think about be a great fit for our new store, “Flatboat Fair Traders.” I slowly form piles while asking about pricing. I explain that I have a store where I sell our products but also offer some of the lines at wholesale for stores around the US. Jairo starts to talk to them about how we help artisans conduct cost analysis sessions around their products to see if any of them have the margins for wholesaling in the States. I ask them if they would like to work with Jairo to help understand their costs and the margins that we work with for exporting wholesale. They quickly answered, “Yes”. We were tight on time since we still needed to visit another artisan group so I proposed that in the next few weeks, Jairo could coordinate with them and come out for a few hours. I asked Maricella to start tallying up my piles of jewelry. I could see her delight while she counted out the earrings and bracelets. “This was an unexpected wonderful sale and connection!” she exclaimed. Jairo and her exchanged contact information. Maricella counted the money and then handed it over to her colleague since she is the 4 person cooperative’s treasurer. Like any truly good leader, Maricella understands the power of sharing responsibility for a business to be successful. I couldn’t help but thinking that I would want Maricella in my barrio if another natural disaster strikes.